Based on type of winding connections we classified armature winding of a dc machine into two types.These winding connections are same for DC generator & DC motor. In this type of winding the completing end of one coil is connected to a commutator segment and to the start end of adjacent coil located under the same pole and similarly all coils are connected. This type of winding is known as lap because the sides of successive coils overlap each other. 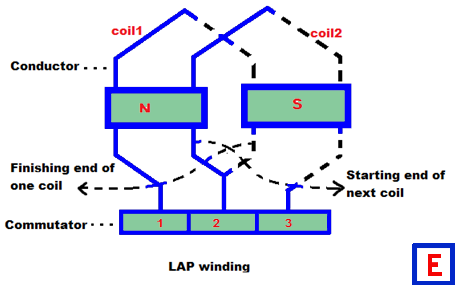 Lap winding may be simplex (single) or multiplex (doublex or triplex) winding. 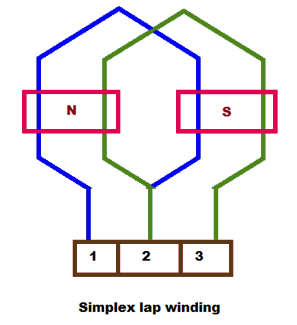 In simplex lap winding the connection of the winding is that there are as many parallel paths as there are number of poles. 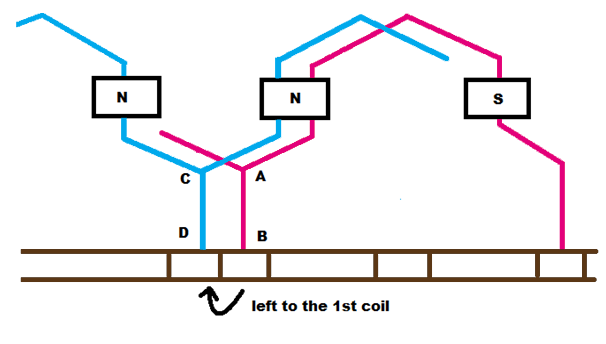 (a) To increase the number of parallel paths enabling the armature current to increase i.e., for high current output. (b) To improve commutation as the current per conductor decreases. 1. The coil or back pitch YB must be approximately equal to pole pitch i.e., YB = Z/P. 2. The back pitch and front pitch are odd and are of opposite sign. They differ from each other by 2m, where m = 1,2,3 for simplex, duplex, and triplex respectively. 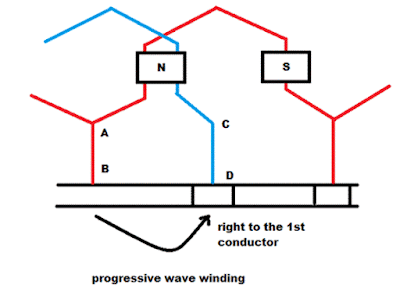 then the winding progresses from right to left and such a winding is known as retrogressive winding. 3. The average pitch,YAVE=( YB + YF )/2. 4.Resultant pitch, YR is always even as difference between two odd numbers is even and is equal to 2m. 5.Commutator pitch, YC = m i.e., , 2, 3, 4 etc. for simplex, duplex, triplex, quadruplex etc. 6. Number of parallel paths = mP. Where, m = multiplicity. 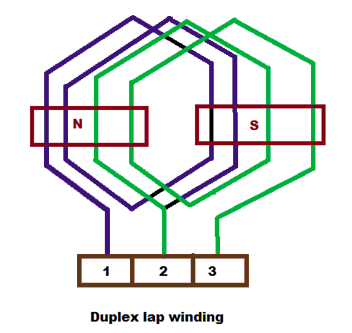 For instance, the number of parallel paths for a 6-pole duplex lap winding is given by 6 x 2 = 12 paths. 7. The total number of poles are equal to the total number of brushes. 8. If Ia is the total armature current, then current per parallel path is Ia /P. 9. Lap winding is used for low voltage and high current machines. In wave winding. 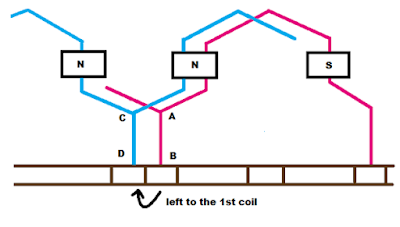 the coils which are carrying current in one direction are connected in series circuit and the carrying current in opposite direction are connected in another series circuit. A wave winding is shown in figure. If after passing once around the armature the winding falls in a slot to the left of its starting point then winding is said to be retrogressive. If it fails one slot to the right it is progressive. 1. Both pitches YB and YF are odd and of same sign. 2. Back and front pitches may be equal or differ by 2 and are merely equal to pole pitch. Z = Total number of conductors. YC =(Number of commutator bars ± 1)/(Number of pair of poles). 5. Number of parallel paths are equal to 2m,where m is the multiplicity. 6. The number of brushes required are two irrespective of the number of poles. 7. If Ia is the total armature current then current carried by each path or conductor is Ia/2. 8. Since a wave winding is a series winding, it is used for high voltage and low current machine. Tags:armature winding of dc machine wikipedia,lap winding and wave winding animation.